Tattooing is a process of implantation of permanent pigment granules in the skin. Tattoos can be decorative, medical or accidental. There has been a exponential increase in decorative tattooing as a body art in teenagers and young adults. Unfortunately there are no legislations to promote safe tattooing, hence complications are quite common. Superficial and deep local infections, systemic infections, allergic reactions, photodermatitis, granulomatous reactions and lichenoid reactions may occur. Skin diseases localised on the tattooed area, such as eczema, psoriasis, lichen planus, and morphea can be occasionally seen. When used as a camouflage technique, colour mismatch and patient dissatisfaction are common complications. On the other hand, regrets after a tattoo are also seen and requests for tattoo removal are rising. Laser tattoo removal using Q-switched lasers are the safest; however, complications can occur. Acute complications include pain, blistering, crusting and pinpoint hemorrhage. Among the delayed complications pigmentary changes, hypopigmentation and hyperpigmentation, paradoxical darkening of cosmetic tattoos and allergic reactions can be seen. Another common complication is the presence of residual pigmentation or ghost images. Scarring and textural changes are potential irreversible complications. In addition, tattoo removal can be a prolonged tedious procedure, particularly with professional tattoos, which are difficult to erase as compared to amateur tattoos. Hence the adage, stop and think before you ink holds very much true in the present scenario. The term tattooing is derived from "tattau", a Tahitian word which translates essentially as "to mark" and is a process of implantation of permanent pigment granules in the skin. It may be done intentionally for cosmetic purposes (decorative tattoos and permanent makeup) or therapeutic purposes (medical tattoos), or introduced accidentally (traumatic tattoos), in case of abraded skin injuries. Although tattooing is an ancient practice, there has been a dramatic increase in recent times among teenagers and young adults, as a cosmetic and decorative body art form. It is also being used as a form of 'permanent makeup' by beauty salons. Medical therapeutic tattooing has been used as a camouflage technique in vitiligo, for breast areola reconstruction after cancer surgery, as camouflage for permanent hair loss after craniofacial surgery, and scars following plastic and reconstructive surgery. There are currently few requirements or regulations and no legislation for the safety of tattoos. Sterility of the pigments and equipment is an uncertainty as many are being performed on the roadside and in makeshift salons. Consequently, the number of reported adverse reactions after tattooing has increased. These are often seen by physicians, but are generally unknown to the public. 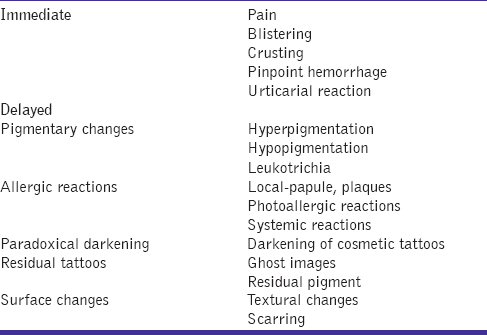 The most common skin reactions to tattooing reported in the literature include a transient acute inflammatory reaction due to trauma of the skin with needles and medical complications such as superficial and deep local infections, systemic infections, allergic contact dermatitis, photodermatitis, granulomatous and lichenoid reactions, and skin diseases localised on tattooed area, such as eczema, psoriasis, lichen planus and morphea ,,,, [Table 1]. In addition there has been an exponential increase in patients seeking removal of tattoos for various psychosocial reasons, especially when names are tattoed and patients have a change of heart or a change of faith in case of religious symbols. Many occupations such as the armed forces prohibit the presence of tattoos and youngsters seek tattoo removal. It has been rightly sung by Jimmy Buffett, an American singer that a tattoo is a permanent reminder of a temporary feeling. Many people who get a tattoo will eventually want to get rid of it. Tattoo removal can also be a tedious prolonged procedure, particularly professional tattoos, hence there is an urgent need to caution youngsters before they get themselves a tattoo. Tattoos by physicians are used in certain medical conditions for camouflage, like resistant vitiligo,  breast areola reconstruction following surgery, scar camouflage following burns or surgery and hair camouflage for permanent hair loss following radiation or craniofacial surgery. 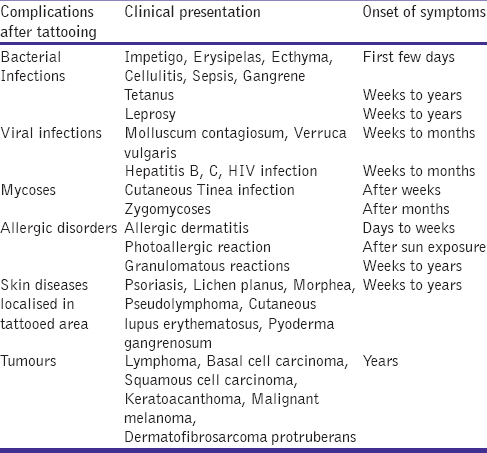 In these settings infections are less common as compared to decorative tattoos as they are carried out in sterile environments, but general complications of tattoos can still occur. The commonest complications are changes in colour, leading to colour mismatch. In vitiligo it is essential to get a good cosmetic skin-coloured tattoo matching with the surrounding normal skin. This requires a great degree of skill and often a colour mismatch leads to worsening appearance of the patch and a dissatisfied patient [Figure 1]. This is more common on the lips, exposed skin and the acral areas. The colour can fade if the pigment is placed superficially or it can appear bluish due to the Tyndall effect if it is placed too deep [Figure 2]. Tattooing should be avoided when the skin is tanned, as when the tan fades, the tattoo will appear darker than the surrounding skin. 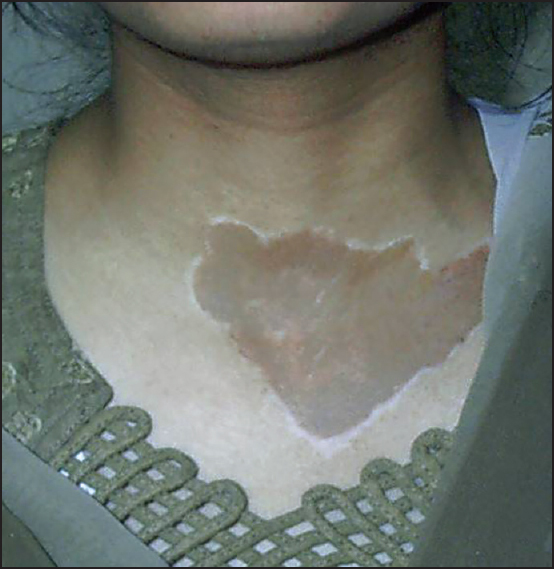 Management for a mismatched tattoo in vitiligo is skin grafting if the tattoo fades, though it is difficult to cover the tattoo adequately if it is deep in the dermis. Small patches can be excised, followed by suturing. These occur mainly due to the unsterile pigments that are implanted and unsterile conditions in which they are carried out. Different reactions have different times of onset as few of them appear immediately after the procedure and some may take days to weeks to years to appear [Table 1]. Transmission of hepatitis B and C virus, , human immunodeficiency virus (HIV),  human papillomavirus (HPV),  molluscum contagiosum virus  and herpes simplex virus (HSV)  infection has been described. In a meta-analysis it was reported that there is an increased risk of infectious complications like hepatitis C when tattooing was not done in professional parlors. There was no definite evidence when it was performed in professional parlours. Bacterial infections related to tattooing comprise infection by Streptococcus pyogenes leading to impetigo, erysipelas and even septicaemia, Staphylococcus aureus causing the rare toxic shock syndrome, skin and soft tissue infections caused by community-acquired methicillin-resistant S. aureus (CA-MRSA), Treponema pallidum using syphilis, infections with atypical mycobacteria  and even Mycobacterium leprae which causes leprosy. A study of 31 female patients with leprosy lesions starting over tattoo marks was reported from a leprosy endemic area from India. In most cases, improper use of hygiene regimens, particularly contaminated needles are causal, but sometimes, contaminated pigments are implicated. Benign lesions such as seborrheic keratosis, histiocytofibroma, epidermal cysts and milia are well known after tattooing but are rarely published. , Malignant lesions complicating tattoos include basal cell carcinoma, keratoacanthoma, squamous cell carcinoma, malignant melanoma and dermatofibrosarcoma protuberans. In one case, a primary non-Hodgkin lymphoma arose in a tattoo. In view of the large number of people that have tattoos and the few cases of malignant lesions that have been reported so far,at present, the association might be coincidental. Numerous factors could be involved, including intradermal injection of potentially carcinogenic substances (benzapyrene in black tattoo ink), exposure to UV radiation and genetic factors. True association is difficult to study and detect. Dark black tattoos may impede a correct clinical and dermatoscopic evaluation, and can mask the development of new melanocytic lesions or the change of existing nevi. Another problem arises when tattoos are removed by laser therapy. Tattoo pigments are phagocytosed by macrophages and are transferred to regional lymph nodes. Therefore, tattoo pigments in draining lymph nodes can be confused with metastatic changes. In case of a concurrently evident malignant melanoma, a histologic pigment analysis is recommended. 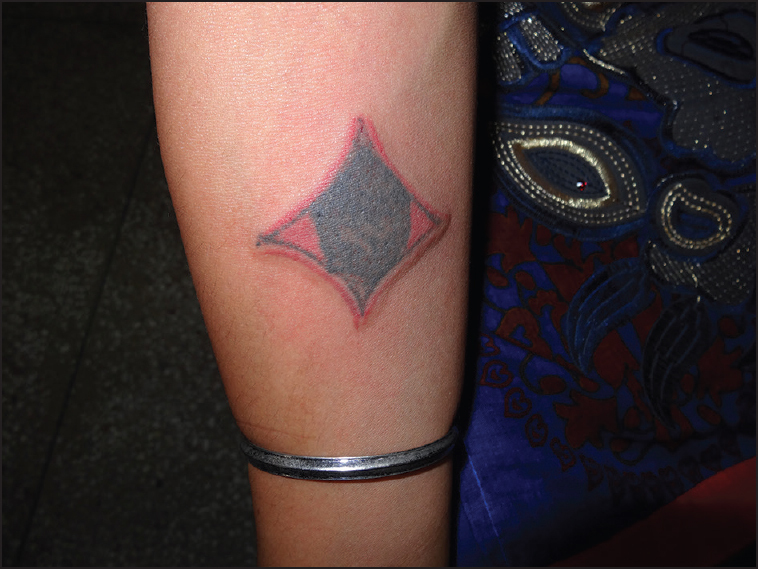 Moreover, tattoos may be used to cover up suspect lesions which can cause delay in diagnosis. With the increasing incidence of tattooing as a fashion trend in society, clinicians should be able to recognise and treat those complications at the earliest and also appropriately counsel their patients on risks of tattoo placement. Thorough clinical history and examination are essential to make a diagnosis. To confirm the diagnosis, skin biopsy is mandatory, especially with a papulonodular growth within the tattoo pigment, since neoplastic conditions are not immediately recognised with clinical examination only. Diagnostic procedures to prove allergic reactions to tattoo colours remain challenging due to the numerous and usually unknown substances in the tattoo inks. So patch testing, as performed in several studies to confirm the diagnosis of allergic reactions, might not be the appropriate approach in tattoos. Allergic reactions can be treated with topical, intralesional or systemic corticosteroids. Topical tacrolimus is useful for lichenoid reactions. Generalised allergic reactions have been reported to subside spontaneously after skin biopsy. Bacterial infections can be confirmed by appropriate cultures and managed accordingly. Viral and fungal infections can be treated by appropriate antivirals and antifungals, respectively. Surgical removal of tumours is done depending on the site and size of the lesion with or without lymph node removal in case of metastases. Active disease needs to be treated in case of koebnerisation with appropriate therapy. A majority of the complications of tattooing can be prevented by following proper guidelines. Strict aseptic precautions are important to prevent bacterial, viral and fungal infections. The instruments should be sterile and preferably all disposables should be used to prevent transmissible infections such as Hepatitis B, C and HIV infection and leprosy. There are regulations that restrict blood donation following a tattoo. The period varies from 4 months to 1 year in different counties. In India the regulation is that blood donation should be avoided within 6 months after getting a tattoo in order to avoid the risk of transmissible infections. Thorough cleaning of the skin to be tattoed is mandatory to prevent resident organisms of the skin from being introduced in the dermis. The inks should be sterile and of good quality without extraneous contaminants to reduce the incidence of allergic and granulomatous reactions. 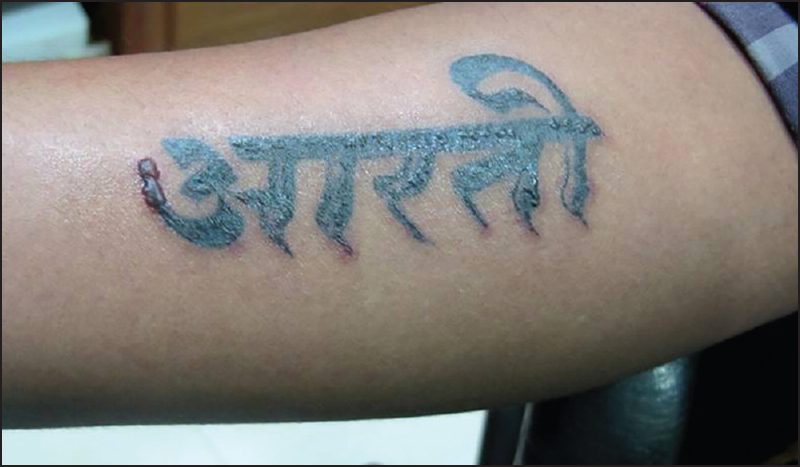 The tattooing should be carried out by trained personnel, so that the pigment is placed in the proper depth. This is important especially in medical tattoos where colour matching with the surrounding normal skin is essential to achieve good cosmesis. To facilitate easy removal special tattoo inks are available which can be easily destroyed using fewer laser treatments  (Infinitink Freedom Inc., Cherry Hill, NJ). This contains bioresorbable dyes encapsulated in polymethylmethacrylate beads with pigments specially designed to permit targeting of the tattoo by specific laser wavelengths. Q-switched lasers have now become the standard for removal of tattoos. However complications can occur, with an incidence of about 5%. On delivery of the laser in the skin, the energy that is absorbed by the pigment is converted to heat, which is the photothermal effect. There is breakage of chemical bonds inside the pigment, which is the photochemical effects. There is a mechanical destruction of the pigments due to photoacoustic effects. Small pigment particles, unknown decomposition products and newly generated chemical compounds are then removed from the skin via blood vessels or the lymphatic system. Pigments remaining in the skin may exhibit different chemical characteristics as compared to nonirradiated pigments again stimulating a reaction of the immune system. Some tattoo pigments containing metals could theoretically break down into toxic chemicals in the body when exposed to light. This has not yet been reported in vivo but has been shown in laboratory tests. It has also been shown that carcinogenic amines are generated by a laser-induced cleavage of azo dyes. The complications of laser tattoo removal can be divided into immediate and delayed [Table 2]. Local allergic reactions, particularly to the red and yellow pigment can occur in the form of pruritic papules, nodules or scaly plaques. Rarely systemic reactions following laser treatment of allergic tattoos have been reported. Photoallergic reactions can occur in the red or yellow ink. These allergic reactions may be early or delayed after several months or years following tattoo removal. These allergic reactions should be treated with topical and intralesional corticosteroids. Paradoxical darkening of tattoos can occur, particularly the light-coloured pink, tan or white-coloured tattoos, which are often used for permanent makeup. This occurs due to reduction of titanium dioxide or iron oxide by the laser, turning the pigment black. Hence a small test area should be done first. When the tattoos turn black, they can be managd by further treatment with the Q-switched lasers. In removal of permanent makeup, it is sometimes wiser to treat with fractional CO 2 laser or fractional Er:YAG laser to avoid paradoxical darkening. The laser should be chosen according to the colour of the tattoo pigment and the patient's skin type. Generally Q-switched 1064nm Nd:YAG laser is safer in darker skin types 5-6. The spot size, the fluence and the pulse duration are important and should be carefully selected. There is a need to increase awareness in the youth today regarding increased risks of tattooing when carried out in potential unsterile environments. In addition tattoo parlors should also be educated about the risks involved and the importance of using proper infection control procedures. 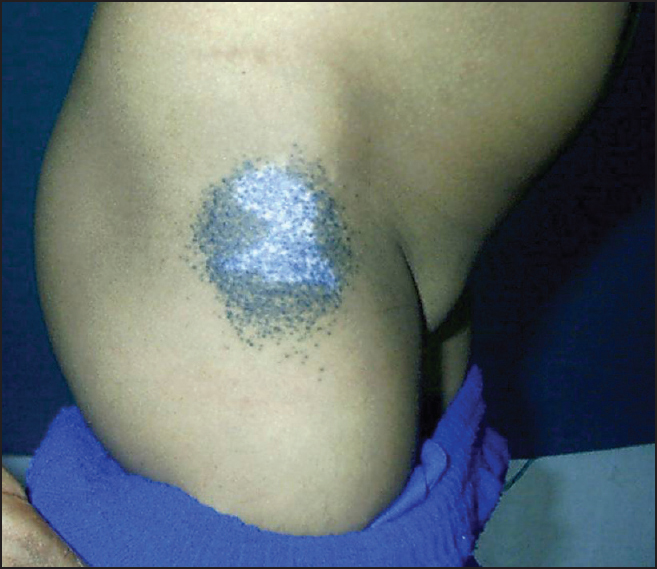 Complications following medical tattoos are mainly due to colour mismatch, due to improper selection of pigment and improper depth of placement that can cause colour fading or bluish discolouration. Complications following decorative tattoos are mainly related to infections and allergic reactions due to failure of aseptic precautions. However, the commonest complication is patient dissatisfaction that compels them to seek removal of the tattoo. Tattoo removal is a very cumbersome procedure, and it may not always be successful, leaving a ghost image, hence the adage, think before you ink holds very much true. Graudenz K, Greve B, Raulin C. Diffused traumatic dirt and decorative tattooing: Removal by Q-switched lasers. Hautarzt 2003;54:756-9. Ortiz AE, Alster TS. Rising concern over cosmetic tattoos. Dermatol Surg 2012;38:424-9. Sanghavi SA, Dongre AM, Khopkar US. Tattoo reactions - An epidemic on the surge: A report of 3 cases. Indian J Dermatol Venereol Leprol 2013;79:231-4. Piérard-Franchimont C, Hermanns JF, Piérard GE. Skin reactions to tattoo ink. Rev Med Liege 2011;66:430-3. Wenzel SM, Rittmann I, Landthaler M, Bäumler W. Adverse reactions after tattooing: Review of the literature and comparison to results of a survey. Dermatology 2013;226:138-47. Garcovich S, Carbone T, Avitabile S, Nasorri F, Fucci N, Cavani A. Lichenoid red tattoo reaction: Histological and immunological perspectives. Eur J Dermatol 2012;22:93-6. Bassi A, Campolmi P, Cannarozzo G, Conti R, Bruscino N, Gola M, et al. Tattoo-associated skin reaction: The importance of an early diagnosis and proper treatment. Biomed Res Int 2014;2014:354608. Kaliyadan F, Kumar A. Camouflage for patients with vitiligo. Indian J Dermatol Venereol Leprol 2012;78:8-15. Klügl I, Hiller KA, Landthaler M, Bäumler W. Incidence of health problems associated with tattooed skin: A nation-wide survey in German-speaking countries. Dermatology 2010;221:43-50. Tohme RA, Holmberg SD. Transmission of hepatitis C virus infection through tattooing and piercing: a critical review.Clin Infect Dis 2012;54:1167-78. Haley RW, Fischer RP. Commercial tattooing as a potentially important source of hepatitis C infection. Clinical epidemiology of 626 consecutive patients unaware of their hepatitis C serologic status. Medicine (Baltimore) 2000;80:134-51. Doll DC. Tattooing in prison and HIV infection. Lancet 1988;1:66-7. Ragland HP, Hubbell C, Stewart KR, Nesbitt LT Jr. Verruca vulgaris inoculated during tattoo placement. Int J Dermatol 1994;33:796-7. Pérez Gala S, Alonso Pérez A, Ríos Buceta L, Aragüés Montañés M, Garcia Díez A. Molluscum contagiosum on a multicoloured tattoo. J Eur Acad Dermatol Venereol 2006;20:221-2. Kaatz M, Elsner P, Bauer A. Body-modifying concepts and dermatologic problems: Tattooing and piercing. Clin Dermatol 2008;26:35-44. Kluger N, Muller C, Gral N. Atypical mycobacteria infection following tattooing: Review of an outbreak in 8 patients in a French tattoo parlor. Arch Dermatol 2008;144:941-2. 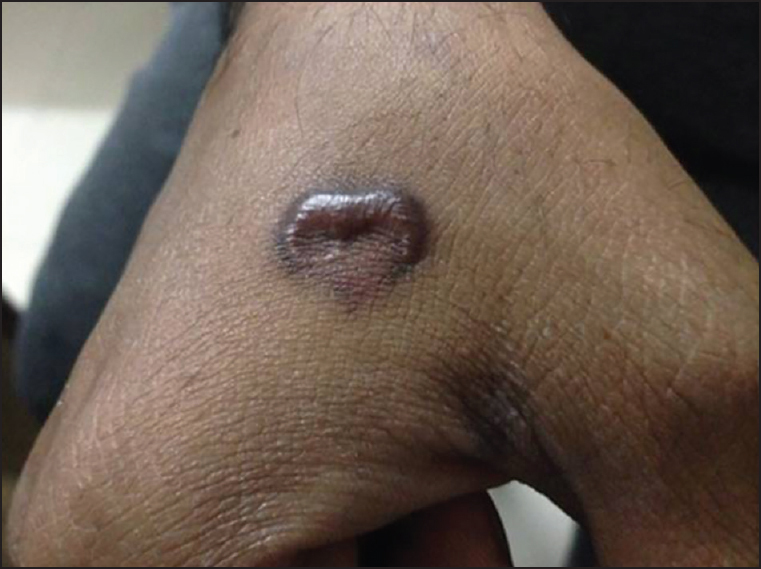 Ghorpade A. Inoculation (tattoo) leprosy: A report of 31 cases. J Eur Acad Dermatol Venereol 2002;16:494-9. Parker C, Kaminski G, Hill D. Zygomycosis in a tattoo, caused by Saksenaea vasiformis. Australas J Dermatol 1986;27:107-11. Alexandridou A, Reginald AY, Stavrou P, Kirkby GR. Candida endophthalmitis after tattooing in an asplenic patient. Arch Ophthalmol 2002;120:518-9. Waldmann I, Vakilzadeh F. Delayed type allergic reaction to red azo dye in tattooing. Hautarzt 1997;48:666-70. Greve B, Chytry R, Raulin C. Contact dermatitis from red tattoo pigment (quinacridone) with secondary spread. Contact Dermatitis 2003;49:265-6. Litak J, Ke MS, Gutierrez MA, Soriano T, Lask GP. Generalized lichenoid reaction from tattoo. Dermatol Surg 2007;33:736-40. Kluger N. Cutaneous complications related to permanent decorative tattooing. Expert Rev Clin Immunol 2010;6:363-71. Mahalingam M, Kim E, Bahwan J. Morphea-like tattoo reaction. Am J Dermatopathol 2002;24:392-5. Balfour E, Olhoffer I, Leffelll D, Handerson T. Massive pseudoepitheliomatous hyperplasia: An unusual reaction to a tattoo. Am J Dermatopathol 2003;25:338-40. Kluger N, Cotten H, Magana C, Pinquier L. Dermatofibroma occurring within a tattoo: Report of two cases. J Cutan Pathol 2008;35:696-8. Armiger WG, Caldwell EH. 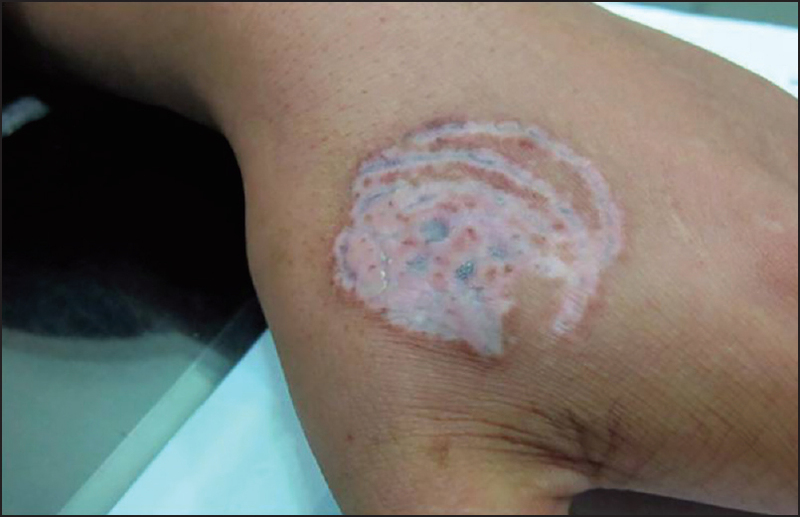 Primary lesion of a non-Hodgkin′s lymphoma occurring in a skin tattoo: Case report. Plast Reconstr Surg 1978;62:125-7. Punzi L, Rizzi E, Pianon M, Rossini P, Gambari PF. Tattooing-induced psoriasis and psoriatic arthritis. Br J Rheumatol 1997;36:1133-4. Horner KL, Chien AJ, Edenholm M, Hornung RL. Winnie the Pooh and psoriasis too: An isomorphic response of guttate psoriasis in a tattoo. Pediatr Dermatol 2007;24:E70-2. La Placa M, Passarini B. Subacute cutaneous lupus erythematosus after a tattoo. Clin Exp Dermatol 2009;34:632-3. Jolly M. Discoid lupus erythematosus after tattoo: Koebner phenomenon. Arthritis Rheum 2005;53:627. Tendas A, Niscola P, Barbati R, Abruzzese E, Cuppelli L, Giovannini M, et al. Tattoo related pyoderma/ectyma gangrenous as presenting feature of relapsed acute myeloid leukaemia: An exceptionally rare observation. Injury 2011;42:546-7. Campbell FA, Gupta G. Lichenoid tattoo reaction responding to topical tacrolimus ointment. Clin Exp Dermatol 2006;31:293-4. Fang H, Wu P, Hsieh H. Generalized lichenoid tattoo reaction with spontaneous resolution after skin biopsy. Dermatolo Sin 2013;31:38-40. Guidelines for blood banks, available from: http://www.cdsco.nic.in/forms/list.aspx?lid=1642&Id=1. [Last accessed on 2014 Feb 12]. Kent Km, Graber EM. Laser tattoo removal: A review. Dermatol Surg 2012;38:1-13. Kilmer SL, Lee MS, Grevelink JM, Flotte TJ, Anderson RR. The Q-switched Nd:YAG laser effectively treats tattoos. A controlled, dose-response study. Arch Dermatol 1993;129:971-8. Vasold R, Naarmann N, Ulrich H, Fischer D, König B, Landthaler M, et al. Tattoo pigments are cleaved by laser light-the chemical analysis in vitro provide evidence for hazardous compounds. Photochem Photobiol 2004;80:185-90. Murphy MJ. A novel, simple and efficacious technique for tattoo removal resulting in less pain using the Q-switched Nd:YAG laser. Lasers Med Sci 2014;29:1445-7. Kirby W, Koriakos A, Desai A, Desai T. Undesired pigmentary alterations associated with Q-switch laser tattoo removal. Skin and Aging 2010;18:38-40. Liu XJ, Huo MH. Permanent leukotrichia after Q-switched 1064 nm laser tattoo removal. Indian J Dermatol Venereol Leprol 2011;77:81-2. Bernstein EF. A widespread allergic reaction to black tattoo ink caused by laser treatment. Lasers Surg Med 2015;47:180-2. Bernstein EF. Laser tattoo removal. Semin Plast Surg 2007;21: 175-92. Anderson RR, Geronemus R, Kilmer SL, Farinelli W, Fitzpatrick RE. Cosmetic tattoo ink darkening. A complication of Q-switched and pulsed-laser treatment. Arch Dermatol 1993;129:1010-4. Bencini PL, Cazzaniga S, Tourlaki A, Galimberti MG, Naldi L. Removal of tattoos by q-switched laser: Variables influencing outcome and sequelae in a large cohort of treated patients. Arch Dermatol 2012;148:1364-9.